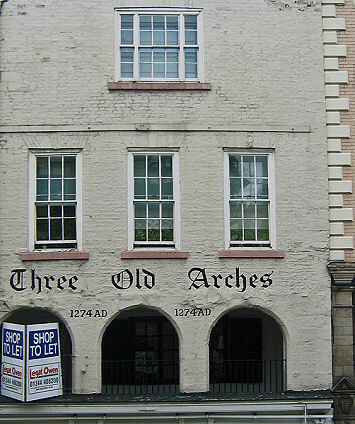 Three Old Arches, at 48 Bridge Street, incorporate part of the famous Chester Rows and is a Grade I listed building. The stone frontage at the street and row levels is considered to be the oldest surviving shop frontage in England. Along with the adjacent building at number 50 Bridge Street, it was once the largest known medieval town house in the Chester Rows, and the stone-walled hall at the row level extending into No. 50 and set parallel to ther Rows, was the largest hall, measuring over 12m by over 8m. The building provides a vital clue to what Chester's medieval stone houses looked like from the street. The Three Old Arches was constructed in the thirteenth century. During the following century it was extended to the south, into what is now 50 Bridge Street, when the hall, was built. During the twentieth century, part of the building was used by William Jones, a grocer. In the 1960s the business was taken over by the department store of Owen Owen, but this closed in 1999. The ground floor continues to be used as a shop. At the level of the row are three round-headed chamfered arches, the piers of which pass down to the ground level, at the sides of the windows and entrance of the shop at this level. Above the arches, in large Gothic script, is inscribed "Three Old Arches". Duplicated at the tops of the piers, between the arches, is the date "1274 AD". In the undercroft of No. 48, the original stone pillars have been replaced by cast iron columns. The undercroft of No. 50 retains its original stone arch. Much of the medieval stone hall still retains four medieval doorways The hall also contains a sixteenth century open fireplace containing a Victorian cast iron range.